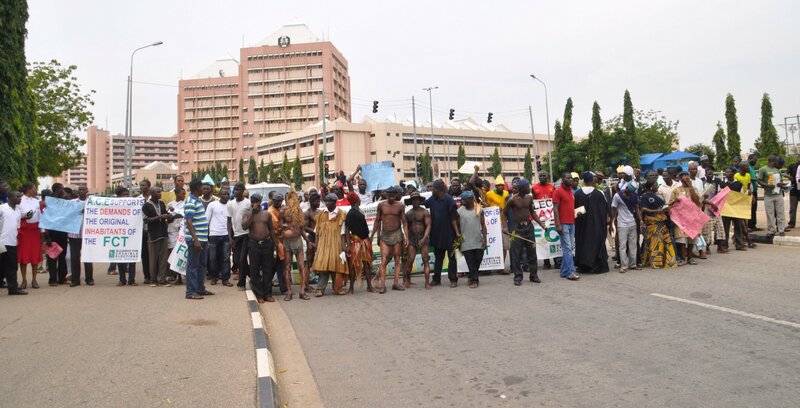 Hundreds of protesters stormed the administrative headquarters of the Federal Capital Territory on Friday, lashing out at the FCT Minister for alleged incompetence. The demonstrators accused Muhammed Bello, who was appointed in 2015, of sitting idly as crime rates soar and auto crashes as a result of defective traffic lights become frequent. In addition to exhausted streetlights and poor waste management, the demonstrators said the minister has displayed incompetence in handling basic amenities across the nation’s capital. This, they said, marks a strange dimension for Abuja, where past ministers were widely regarded for their hands-on approach that guaranteed functional municipal infrastructure. “Since the creation of Abuja, this minister is the most clueless,” Deji Adeyanju, one of the organizers of the protest stated. The protest began around 11:00 a.m., and participants carried placards bearing anti-government slogans. The march comes a few months after it was reported how residents were growing increasingly frustrated by the poor state of facilities in Abuja. Nonso Ifedili, a commuter, said he had witnessed accidents happen because the traffic lights malfunctioned at busy road points. “Recently, a cab I boarded to Area 3, Garki almost had a head-on collision with another vehicle close to the National Defence College. The traffic lights showed green on all the stands at the same time, resulting in a maddening rush”, Mr. Ifedili said at the time. Other residents interviewed for the report cited concerns from barely lit roads and walkways to an increase in criminal activities like pick-pocketing and other petty thefts. A spokesperson for Mr. Bello could not be reached for comments, but the minister has often blamed vandals for the decrepit facilities. Mr. Adeyanju said kidnapping has now become a regular feature of events in Abuja, and gave the minister a seven-day ultimatum to sit up. The immediate execution of turn-around maintenance works on streetlights and traffic lights within the Abuja metropolis and an immediate improvement of the refuse disposal system in Abuja are amongst the seven areas where the protesters demanded urgent action from the minister. “We demand that these conditions be met within the next seven days failing which we will be compelled to hold protests at night to highlight the decaying state of infrastructure within the city,” Mr. Adeyanju said in a statement.